Who could go to Paris and not resist having a little wander? The sun was shining and it was a beautiful day so my family and I decided to explore a little bit of Parisian street life by taking a walk down the banks of the river seine. 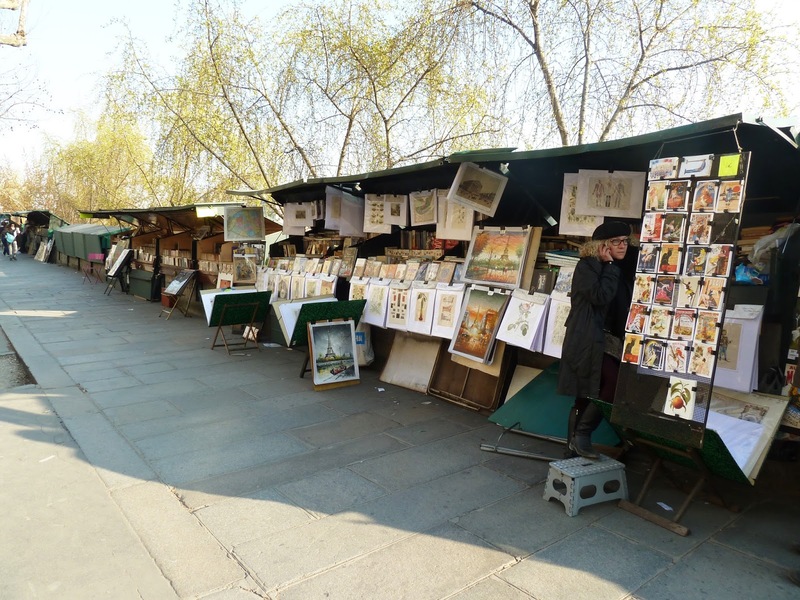 Lining almost every inch of the banks were quaint wooden market stalls selling all kinds of hidden treasures, from old fashion books to magazines and drawings. I had to control the urge to buy everything I saw although I quickly realised all the books and magazines were in French so this put a limit to my spending anyway. After trawling through a stall packed high with every type of fashion magazine imaginable I finally came across some English versions and naturally treated myself to some old magazines – they were a real bargain too! The French owner of the stall and I started talking (mainly through hand gestures as my French is non-existent) and he pulled out fashion illustrations he had drawn, telling me how he used to be a designer. I really wished I could have spoken French just to find out a little bit more and bought some of his sketches as they were amazing. On the way back to the hotel I came across a man drawing huge portraits on the pavement in chalk. It got me thinking about street art and ways people express themselves and I took a few snaps of his work to show you. All in all a productive day exploring the artistic side of Paris! A door at Hotel De Ville that caught my eye and I couldn’t resist snapping a photo to share with you. 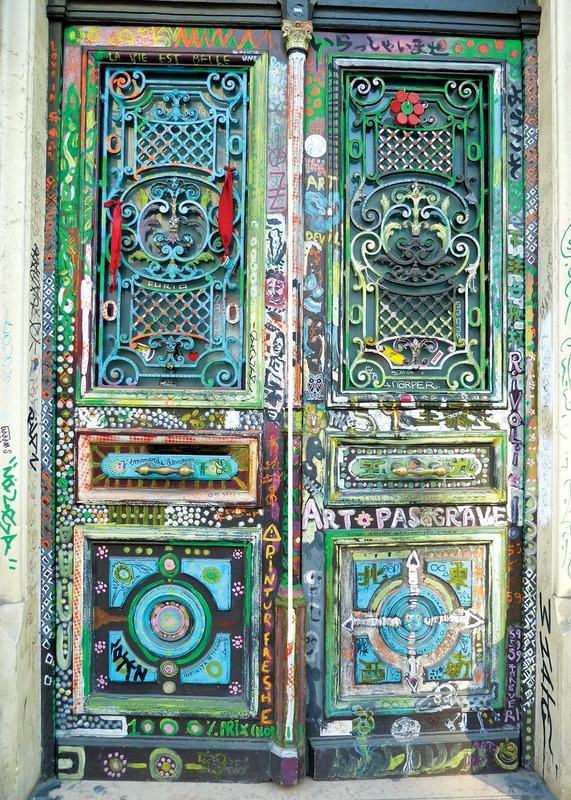 I love how it’s been used as a canvas and how the ironwork on the door works with the vibrant colours to really make it stand out. This sort of street art is one of a kind which makes it even more interesting to look at. This got me thinking about graffiti art in general and the effect it has on passers by. Artists such as the controversial Banksy, who’s satirical street art can be found on public surfaces all over the world, use graffiti to tell stories and send messages to their audience and despite being labelled as vandalism by some, his graffiti has inspired thousands and continues to have a very vast fan base – particularly among the rich and famous. A friend of mine recently showed me the work of Paul Curtis, otherwise know as ‘Moose’. Instead of adopting the typical methods of graffiti, Curtis uses street surfaces that are dirty and cleans parts using stencils, creating artwork. I thought this seemed a little strange and couldn’t work it out but when I saw photos of his work I was amazed at how intricate and clever it was. Using daily cleaning equipment he washes dirty, grimy surfaces to create artwork known as reverse graffiti and his unusual approach has led to him to work with top cleaning brands such as Ariel.